CMI's Credit & Collection Trivia Quiz - Credit Mediators Inc. In which country, principality or city was the first stock exchange established? Answer: Technically Belgium but credit will also be given for choosing Venice. Please read below. 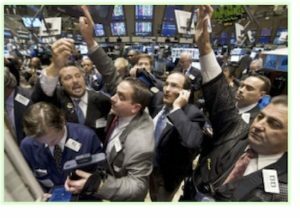 When people think of stock markets, images of the New York or London Stock Exchanges come to mine where millions of trades of are made each year with still millions of people employed the world over to support this human financial phenomenon. However, like many of our modern industries of gargantuan proportions, the trading of securities started out very small and slowly evolved throughout the centuries. In fact, you may be surprised to learn that the first exchange thrived for quite some time without a single stock actually being traded. Let me explain. Then In the 1300’s, the Venetians, who were the leaders in European finance, started trading “ debt issues” owed by governments. They would carry slates with information on the various issues for sale, meet with clients, and then take the buy and sell orders much like a broker does today. But it was in Antwerp, Belgium where a full-fledged “stock” exchange in 1531 was created. Brokers and moneylenders would gather together to deal with business, government and individual debt issues. Although it may seem a little strange to think of a stock exchange that dealt exclusively in promissory notes, in the 1500’s there were no real stocks. There were many flavors of business-financier partnerships that produced income like stocks do, but there were no official company shares that changed hands. Finally, by the 1600’s, the Dutch, British, and French governments all gave charters to companies with “East India” in their names, in which one could buy a share in the company. The main purpose of allowing the purchase of shares by several investors was to lessen the shared risk of a lost ship carrying spices and other products coming back to Europe. These became the first shares of stock to be bought and sold, both on and off an exchange.